Printed and Sold in Bow-church-Yard, London. These texts appear above the two columns that contain the Christmas song. From the XXth Chapter of Exodus. 1 THOU shalt have no other Gods but me. 2 Before no Idol bend thy Knee. 3 Take not the Name of God in vain. 4 Nor dare the Sabbath-day profane. 5 Give both thy Parents Honour due. 6 Take heed that thou no Murder do. 7 Abstain from Deeds and Words unclean. 8 Nor steal, tho thou art Poor and Mean. 9 Nor tell a wilful lie, nor love it. 10 What is thy Neighbours do not covet. Our Saviours Golden Rule, from Matt. vii. 12. Whateer you would not make again. Salvation ascribed to Jesus Christ. GLORY to Jesus Christ, the Son. Who made our Peace with Heavn. Note: In the original transcription, missing letters were included within square brackets. To make it easier to read, I have omitted those brackets on this page. In sending us his belovd Son. We have great reason to remember. That they could have no room at all. But in a filthy oxs stall. Mans God and Saviour for to be. The blessed babe sweet Jesus born. The Virgin Mary by him staid,? Being both mother, maid, and wife. Their gifts of gold and odour sweet. Praises unto our heavenly King. Be unto Christ our Saviour. To have poor sinners justifyd. To save thy life, to do thee good. Himself a sacrifice he gave. In fasting, preaching, prayer divine. Must suffer death upon a tree. With bloody spear they piercd his heart. Only to do us sinners good. Tho just, none so unjustly dyd. The whole worlds debt all in one day. Be Honour, Glory, Power, Fame. Printed and Sold in Bow-church-Yard. London. All You That Are Unto Mirth Inclined, saved under the title The Sinner's Redemption (Cecil Sharp, English-Folk Carols, 1911). Sharp reproduced the following verses in English Folk-Carols (London: Novello & Co., 1911): 1, 2, 3, 7, 8, 9, 10, 16. All You Who Are To Mirth Inclined - Fuller Version - A compilation from various sources. 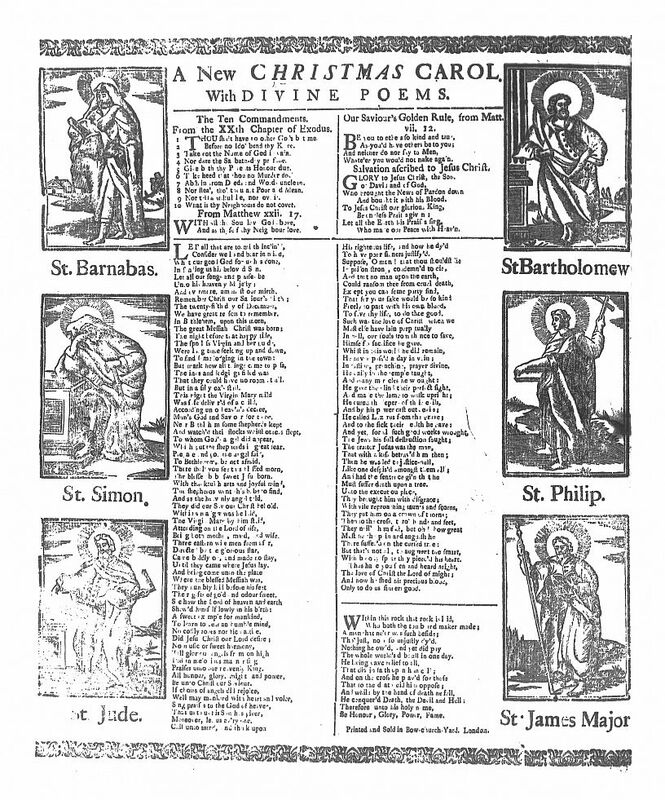 Let All That Are To Mirth Inclined, Broadside from the Roxburghe Collection saved under the title A New Christmas Carol.